Irish Record 5lb 11oz taken on 3.08.1975 by V. Morrison at Causeway Coast. 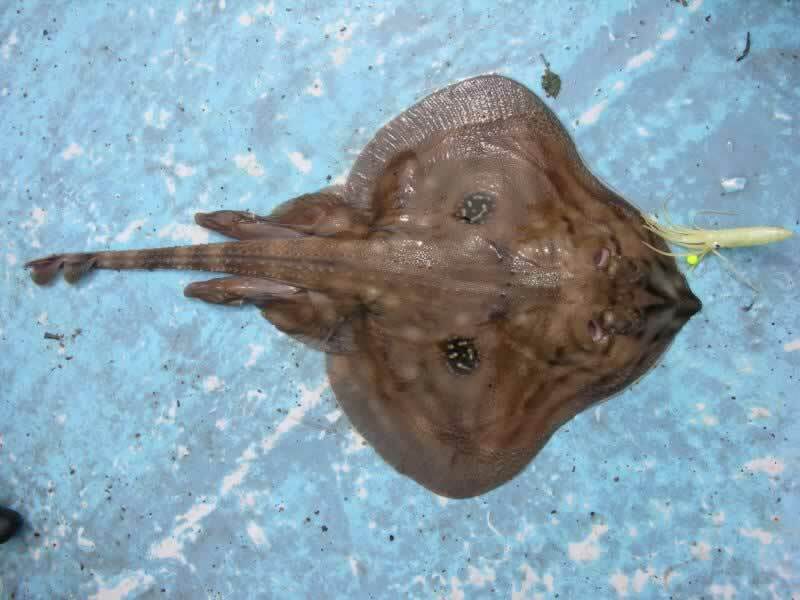 Cuckoo Ray are triangular shaped with short tail and pointed snout. The under-side is light coloured and the top-side usually sandy or tan, but may be darker at times when caught over broken ground. This ray is very easily identified by the two black and white mottled circles, one on each wing. like a pair of eyes looking up at you! 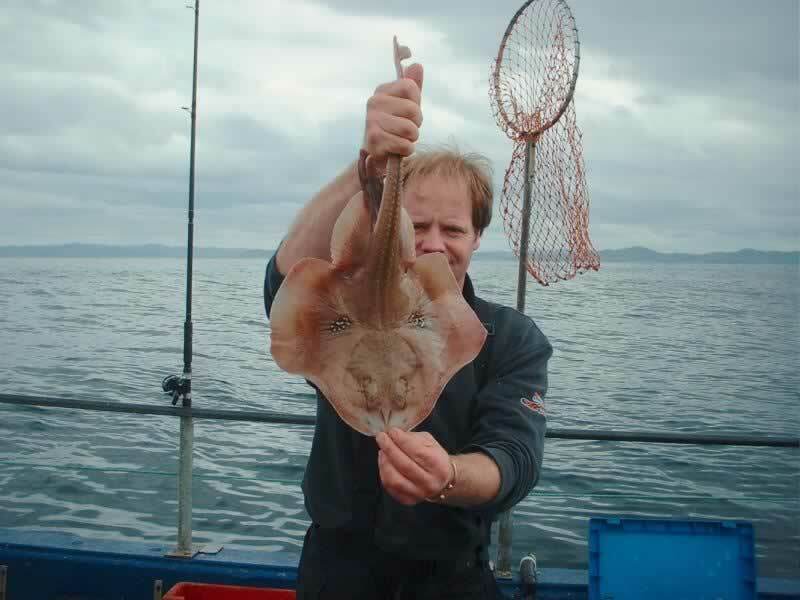 The Cuckoo Ray appears around most of Ireland but it is quite a difficult species to target. It is usually caught whilst fishing for Blonde Ray or Homelyn Ray as it enjoys the same territory, i.e., deep shelving sandbanks and fast tidal currents. It rarely exceeds five pounds in weight and is easily distinguishable from other Ray by the two large mottled circles, one on each wing. Cuckoo Ray have shown in Mulroy Bay, Donegal, Red Bay and Glenarm, but for an excellent chance to see this species, fish the many off-shore sand banks out of Ballycastle, Portrush and Portbalintrae on the North Antrim coast. There have been many Cuckoo Ray, including fish up to and over the Irish specimen weight, caught and released on these venues over recent years. The Causeway Bank out of Portrush holds the current Irish record. 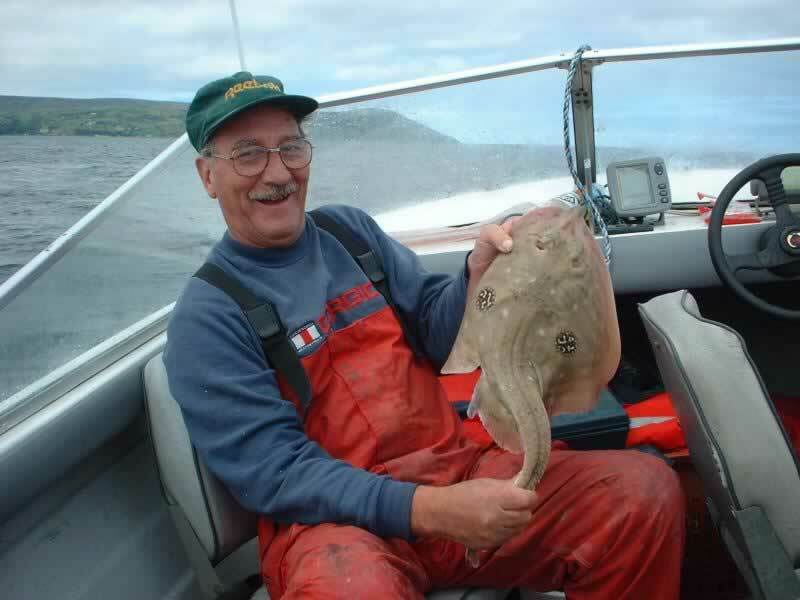 The occasional ray will show to shore anglers trying out marks along the Antrim Coast, from Cushendun and Cushendal, through Waterfoot, the famous “ledge” mark south of Waterfoot and into Glenarm. As the sea temperature begins to rise in May- June and onwards, you will see many of our ray species beginning to show. Cuckoo Ray are one of the early arrivals on the north coast. Cuckoo Ray are similar to all other Ray and are basically predators. Small fish baits such as Mackerel strip or Herring are excellent, but they do have a particular fondness for whole Sand Eel or sections of Launce. A Running Ledger is by far the best method for Cuckoo Ray or indeed any other Ray being targeted when boat angling. The hook length should be eight to twelve feet long to give the bait some movement in the tide and luminous muppets or beads can be useful attractors although not entirely necessary. A fifty pound breaking strain hook length is sufficient to land any Cuckoo Ray. However, many of these areas that produce ray also produce Spur dog and Common Skate, so you may wish to “beef” the gear up a bit in these circumstances. This does not seem to affect the catch rate, and will handle any larger fish that tend to show up just when you are not expecting them!